Robert Welch's designs for the firm J & J Wiggin, which marketed Old Hall tableware, are some of my favourite collectables from the fifties and sixties. They capture the spirit of the age. Robert Welch used a new material, stainless steel, to create some striking modern designs. Old Hall products were one of the most desirable household items in the sixties. They were a favourite wedding present, and like G-Plan, it was a brand people aspired to own. Although always collectable, there has been a renewed interest in Old Hall and particularly the Alveston range. Values are appreciating and it looks to be a good investment. Robert Welch became a design consultant to Old Hall in 1955. His first design, produced in collaboration with David Mellor, was the Campden range. The inspiration came from modern Scandinavian style. The Campden range included cutlery, but the most famous designs from the range were the toast rack and the coffee set. Robert Welch won a design award for the toast rack in 1958. The range is severely modern and the teak handles on the coffee and water pots add to the Scandinavain feel. Pieces have a satisfying weighty feel to them. They are marked 'Designed by R.Welch, Old Hall England, 18/8 stainless steel. Expect to pay in the region of £30 for the coffee pot and £50 for the set. Toast racks are more common and sell for £7 to £10. The cutlery is expensive if bought in single pieces; they sell for about £7 each. Old Hall Campden cutlery sets are better value. Alveston was Old Hall's flagship range in the 60s. Designed by Robert Welch in 1962, its profile was both modern and amusing. The shape gave rise to the alternative name: Aladdin. The Alverston range is a firm favourite amongst Old Hall collectors; the tea sets are particularly prized. A full Alveston tea set comprising teapot, water jug, milk jug and sugar bowl will sell for £200 plus on eBay. Expect to pay at least £100 for the teapot on its own, although you should be able to pick up an Alveston range water jug for less than £50 on its own. The Alveston range included a full set of cutlery: knives, forks, spoons and soup spoons. You will need to pay around £400 for a full set, but individual pieces sell for about £7 each. Original pieces from the 60s will be marked Old Hall England. Oneida bought the Old Hall brand in the 1980s. They manufactured this design in the Far East until recently. There is little difference in value between the newer and older versions. 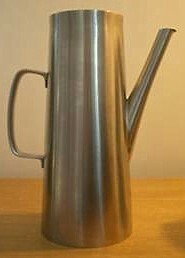 New for 1970 Robert Welch designed this ultra modern tall coffee pot. Originally the range did not have a name, but it later became known as Super Avon, following on from an earlier design called Avon. There was also a milk jug and sugar bowl, as well as a very rare vacuum milk jug. 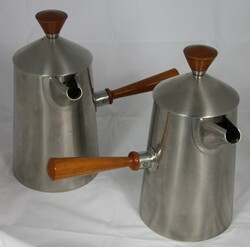 These coffee pots sell for £60 to £100 on eBay as they are such an iconic design. With a renewed appreciation of the 70s and early 80s, they are likely to increase in value. The Connaught tea service was Old Hall's most popular range. It was not designed by Robert Welch, but by Leslie Wiggin. However, it is still well proportioned and of high quality. The Connaught is a great everyday teapot. We use one every morning for a pot of tea with our breakfast. It is also the bargain in the Old Hall range. Tea pots and sometimes full sets can be bought for around £20. So if you want a cheap way to start collecting Old Hall, then begin with the Connaught range. 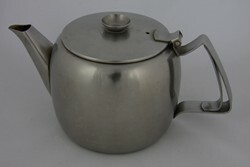 It is of far better quality than the majority of stainless steel teapots from this era. The Old Hall Club website is a very good source of information on Old Hall. Check out their Internet auctions page for some more tips. Do you know where I can purchase a RW1 bright table fork. I was given my cutlery set as a wedding gift 15 yrs ago. My late mother in law and I had so much fun visiting the Robert Welch store in England and picking the set.My table fork has gone missing and would love to keep the set in take. I have contacted the company and they have advised me that the RW1 brite is discontinued. Please contact me if you can help or know anyone that can. "I have a boxed set of Old Hall cutlery which I think is Alveston design although there is nothing to confirm this on the cutlery or the box, There are 76 pieces in all and it is in beautiful condition, it includes fish knives, forks, serving spoons etc. Each piece is marked with Old Hall, Stainless, Sheffield, England. How would I confirm the design? Is there any value or interest in these large boxed sets? "Dear Pat&Norma If you have not found the items you are looking for I have these items in stock with a good selection of other Old Hall items together with Viners Studio range. Marylebone London NW8. Tues to Sat.